I’m not really sure how all of these guys are going to make a living, but there sure as hell is no shortage of innovation in social media. The torrent of new digital tools and gadgets makes Sharper Image, SkyMall, and Hammacher Schlemmer look like an Amish electronics store. Just in OneForty alone (the unofficial Twitter app store), there are thousands of add-ons to improve or enhance your tweeting. Earlier this year, I wrote a post called 39 Social Media Tools I’ll Use Today, which documented the stuff that helps me do my job. Not surprisingly, some of those sites and services have changed considerably in the ensuing months. Some are gone entirely, ghostly vestiges of the good old days of February of this year, when we still called people “fans” not “likes”. I am a screenshot freak. Because I do so many presentations and Webinars, I’m constantly grabbing elements of Web pages to send to people, to use in Keynote, etc. Curate.us (formerly known at Clp.ly) makes this easier. Just install the Curate.us button to the bookmarks bar of your favorite browser, and then click the link any time you see an element on a Web page you want to grab or share via Twitter, Facebook, etc. You can grab a single quote from a blog, a photo, or a whole page. You can even add digital sticky notes to your capture to remind yourself why you thought it was noteworthy. Curate.us is free. The only real shortcoming is that you can’t clip pages that require log-ins (Facebook, for example). As Twitter users begin following more and more people – thanks in no small measure to Twitter’s new recommended users feature – it can get pretty messy to find the meat through all that lettuce. In fact, I almost never look at the public stream comprised of all the people I follow on Twitter. It’s too cacophonous. Instead, I use Twitter search and Twitter lists (especially) to create versions of Twitter that are more manageable in size and similarity. Previously, creating a Twitter list for yourself was a bit of a tedious process. You had to find all the people that you mentally grouped together (“people in Flagstaff” or “social media consultants” or “people that are mentioned in The Now Revolution“) and add them manually to the list. Formulists.com makes this list creation process MUCH easier. Just determine the parameters of the list you want to create, such as Recent Followers; People Who Are Like Me (based on your bio, ~ follower count, location, etc. ); People Like @jasonfalls (as if); People that Retweeted you in the past month; or even lists with and/or parameters like People Who Are Florists in Indiana. 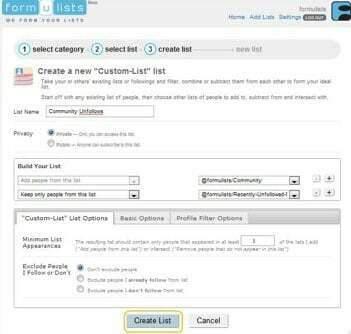 Once you select your criteria, Formulists instantly creates the list for you, and you can then view it from Twitter.com, Twitter on a mobile device, or any Twitter client such as CoTweet (client), Hootsuite, and the rest. Formulists is free, and they allow 15 new users per day. 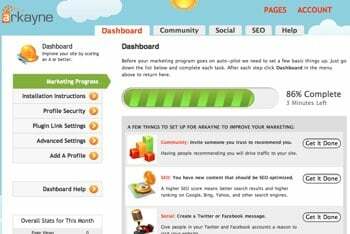 This tool combines search optimization with recommended content functionality. You’ll see Arkayne at the bottom of this post. It automatically recommends to you other blog posts from within the Arkayne network that are similar to what you write about. Conversely, other blogs in the Arkayne network recommend the posts you write, which drives more traffic to your site. Arkayne is already one of the top 10 sites sending traffic to this blog. Your Arkayne dashboard also gives you a score for each blog post before you publish it, helping you refine you search optimization. Robust analytics and reporting is included. Arkayne is priced based on the number of pages where you have it installed, not the number of websites, so that can be a bit confusing for new users. For most blogs, Arkayne costs $19 per month. I’ve been meaning to install Wibiya for a long time (you’ll see it at the bottom of this page), and finally got around to it. It’s a very useful toolbar that allows for colossal customization. 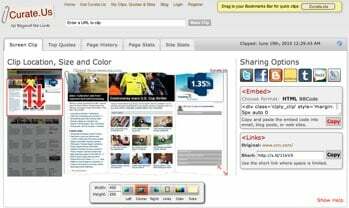 You can configure your custom Wibiya to include links that enable visitors to do a great many things such as translate the page into other languages; share the page on Twitter and Facebook; “like” the page on Facebook, link to your YouTube video gallery; show a random blog post, etc. The Wibiya dashboard tracks how often your visitors have clicked each of these buttons, which is useful in helping decide which features to keep and which to jettison. Wibiya is free unless you want a custom design and some other pro features that cost between $5 and $10 per month. 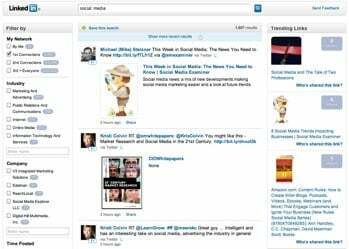 A good example of a custom Wibiya can be seen from my friends over at Social Media Examiner. Hello Bar powers the toolbar you see at the very top of this page, where I use it to promote my new book. It’s incredibly easy to install, and you can update the text in your Hello Bar via Twitter by using the hashtag #hellobar. This is very useful if you want to highlight a particular feature on your website on a particular day, or at a particular time of day. Linkedin Signal is what Twitter search could be (and should be). Linkedin is getting serious about integrating with other corners of the social Web, and Signal (and the new Company Pages) shows what they can do. Just sign up for Signal here, and you’ll have access to a highly customizable, real-time engine that allows you to search by Linkedin connection status (1st degree, 2nd degree), region, date, company, keyword, school (I get way more retweets from Arizona State grads than any U of Arizona alum deserves) and more. With smart, useful tools like this, Linkedin is going to be a force that merits additional attention in 2011. Which of these tools have you tried? Which are you most interesting in trying? I’d love to hear your thoughts, thanks.